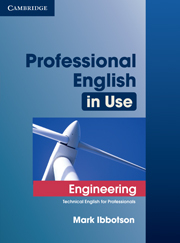 Professional English in Use Engineering presents and practises over 1000 words and phrases to help you function in English in your everyday working life. Using the highly successful format of presentation on the left hand page and practice on the right hand page, Professional English in Use Engineering presents essential vocabulary in context to help you use the words more easily. 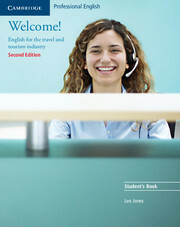 Easy to use, attractively designed in four colours throughout and and fully comprehensive, this book will be invaluable for anyone needing to use English for their professional lives. It is suitable for one-to-one classroom use and self-study. Authentic texts, real companies and credible scenarios make the book up-to-date and practical for engineers. A full index with phonemic script offers extra support for students. Welcome! is an intermediate level course for people who need to use or who are preparing to use English in their day-to-day work in the tourism, hospitality and travel industries.